You arrive at Auckland Airport. During the tour to your accommodation you will make acquaintance with the "City of Sails", as Auckland is also called. Auckland approximately one million inhabitants and is the largest city of New Zealand. Auckland rests on a chain of around 60 extinct volcanic cones and an un-ending procession of sails in the port is typical for the relaxed way of life here. Untill1865, Auckland was the capital and is today the economical center of New Zealand. A city tour (depending on arrival time) takes you along the waterfront and the historical suburb of Parnell with its beautifully restored colonial houses. Enjoy the wonderful panoramic view over the city from the summit of the ancient volcano Mt. Eden. Depart Auckland and travel through rolling farm land, flat dairy plains, and the forested Coromandel Ranges, with views of the Pacific Ocean to Tairua. Tairua’s Paku volcanic peak, and off-shore views of the jagged Alderman Islands are the natural focal points of the area. In the afternoon we visit Hot Water Beach thermal area, if tides allow, and can relax in hot spring water which mixes here with cold sea water. Not far from the beachside village of Hahei lies the impressive limestone cave of Cathedral Cove, which you can explore on foot or see from a boat. In the late afternoon, arrive in Tairua. 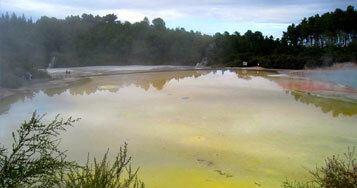 Travel to Rotorua via Tauranga, taking in part of the Pacific Coast Highway. Pass beautiful coastal scenery, kiwifruit and citrus orchards and lovely freshwater lakes before arriving in the geothermal city of Rotorua. Visit the Rainbow Springs Park, featuring crystal-clear springs, a Kiwi night house, and see the Tuatara - an ancient, lizard-like reptile dating back to the age of the dinosaurs, about 220 million years ago. We visit Te Puia, the Maori Arts and Crafts Centre and Thermal Reserve with its boiling mud, silica terraces and famous Pohutu Geyser. The world-famous and live Sheep Show at the Agrodome is an exciting and informative insight into agriculture in New Zealand. See 19 sheep breeds walk the stage, sheep shearing, Sheepdog demonstrations, take the opportunity to hand-milk a cow on stage, enjoy lamb feeding and witness an exciting sheep auction. Audience participation is a major part of the show. In the evening, you will attend a Maori cultural performance, including a feast. The traditional food (Hangi) was cooked in an earth oven on hot rocks. Travel through an important forestry area reaching the picturesque, fast-flowing Huka Falls. The Thermal Energy Plant at Wairakei is of great technical interest. Lake Taupo is the largest lake in NZ and of volcanic origin. We drive through one of the most important wine and fruit growing areas and reach Napier. Destroyed by an earthquake in 1931, the city has been rebuilt in its famous art-deco-style. City tour in the afternoon. Shortly after Napier, we stop at the Te Mata hill. We travel south with another stop in Takapau. Via Palmerston North we reach the Southward Car Museum before arriving in Wellington. We drive to Mount Victoria (196m), from where you can enjoy a beautiful view over the city. The top of the cable car, a Wellington icon running from Lambton Quay, also gives a fine close-up view of the city. From here, you can visit the Observatory and stroll back through the 26 ha Botanic Gardens, extending all the way down to the parliamentary complex. Wellington has been the capital city since 1865, and the Parliament’s Buildings, including the “Beehive”, are well worth visiting. The Old St Paul’s Cathedral features a striking interior made from native timber and magnificent stained-glass windows. 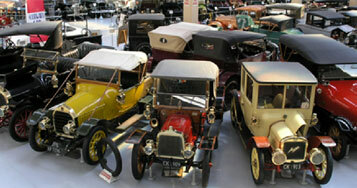 Apart from its importance as the political centre, the city offers a large cultural choice of museums and art galleries. Visit the modern National Museum Te Papa, which gives good insight into NZ history and Pacific culture. In the afternoon we board the Interislander Ferry to cross the Cook Strait. The trip leads us through the beautiful Marlborough Sounds to Picton, a small harbour township in the South Island. We continue our journey to Blenheim, where we have an optional lunch. We visit a vineyard for dinner and a wine tasting. The Marlborough plains produce one of the best wines in NZ. The viticulture in this region began in the 70's, as Montana Wine" in Auckland looked for more land. The composition of the soil, lots of sunshine, a long autumn and cold winter, seemed to be excellent conditions for a first-class wine, in particular Sauvignon Blanc. 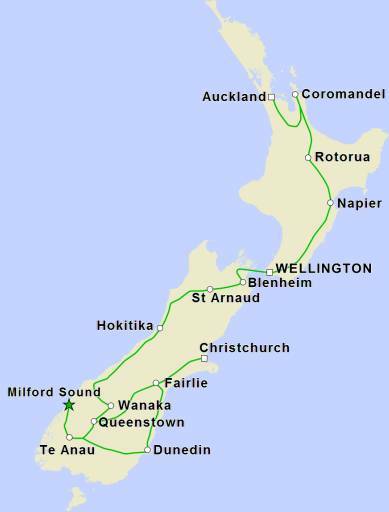 When the cultivation of wine began in 1973, few expected that this region would become (in a little more than 20 years) the largest and most well-known wine area in New Zealand. Fruity, distinct tendencies of the first wines influenced winemakers as well as wine drinkers and kindled a surge in the cultivation of wine. Sauvignon Blanc is the most popular wine, with Chardonnay in second place, followed by Pinot Noir and Riesling. Sparkling wines are also getting more and more popular. You make your way to the West Coast. 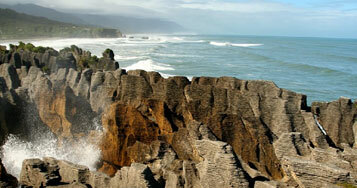 Next your journey takes you to the Pancake Rocks of Punakaiki. These bizarre rocks belong to the spectacular Paparoa National Park with its wide range of geological features such as gorges, limestone caves, and a varied lowland forest (including the most southerly palm trees in the world, the Nikau Palm). The soft chalk rocks are permanently being eroded by the wild Tasman Sea. They lie clearly separated from the harder deposits and this makes them look like piles of pancakes. Rugged, green and wild, the West Coast was in the nineteenth century one of the busiest and richest areas, when gold drew men from all over the world. Stop at Shantytown where you’ll have lunch and try your competence in gold panning! 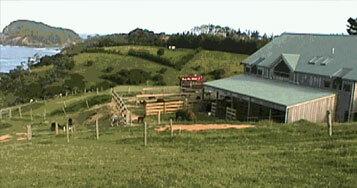 Travel south along the narrow strip of land bordered by the Tasman. Sea on one side and the snow-clad Southern Alps on the other. Today we continue southwards along the breathtaking West Coast passing through luxuriant forest. Depending on time we take a leisurely stroll around Lake Matheson, a photographers dream with its magnificent forest and mountain reflections. You have the option for a helicopter flight to Mt Cook and the surrounding glaciers (optional). The Westland National Park belongs to the most fascinating and multi-faceted national parks of New Zealand. At Lake Moeraki, in the middle of the evergreen rain forest, you can undertake an easy one-hour walk through the moss and algae clad primal forest. You emerge from the forest at the wildly foaming Tasman Sea at Munro Beach. You continue across Haast Pass, the water and climate frontier of the Southern Alps and reach the area of Mount Aspiring National Park, driving along the idyllic Lake Hawea and Lake Wanaka. Depart for Queenstown in the morning. Mountains are a permanent backdrop of the road which passes through rocky gorges, and old gold-digging sites, to the alpine resort of Queenstown. The former gold mining town of Arrowtown is a living, historic holiday destination. Spectacular scenery, four very distinct seasons and a tranquil atmosphere are the attractions for stopping here. Queenstown was the site of the largest gold rush in the country back in the 1860's, and now it has an international reputation as the adventure capital of the world.The combination of a unique alpine setting, located next to a freshwater lake, a wide range of activities and a compact town centre add to its attraction. Reputed to be the steepest lift in the Southern Hemisphere, the gondola carries you high above Queenstown to the Skyline complex located on Bob's Peak. Situated an easy five minute walk from central Queenstown, the gondola is an all weather tourist attraction in its own right. Sit back and relax as the views from the Gondola unfold while you journey to the Skyline complex (includes lunch). 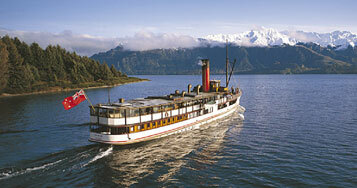 At the wharf you can board the TSS Earnslaw, a 1912 coal-fired steamship to cruise the lake Wakatipu. The one hour cruise takes us to the other side of the lake to Walter Peak Station, a working sheep farm station in a glorious lakeside setting. Enjoy a cocktail on board the vessel before you arrive at the farm (optional). The morning is at your leisure. In the afternoon, we head to Te Anau via Kingston and Mossburn. Some of the most wild and dramatic scenery in New Zealand can be found in Fiordland, in the south west corner of the South Island. 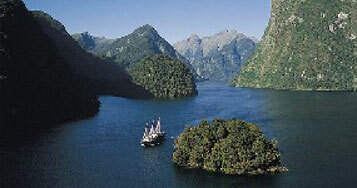 Fiordland is one of the largest National Parks in the world and a World Heritage area. Here the power of nature stuns the enthralled visitor - from its waterfalls tumbling hundreds of meters into virgin, forested valleys and lonely fiords, to endless stretches of shimmering lakes and granite peaks. The road to Milford Sound is one of the world’s finest drives. From Te Anau the road winds down the Eglinton and Hollyford valleys, then through the Homer Tunnel to be met by Mitre Peak - towering from the glassy waters of Milford Sound. Milford Sound is the most famous and accessible of the fiords. Boat trips on the sound are a must and provide close up views of the awesome scenery. We board a ship and cruise in the Sounds. We have Lunch on board and arriving back in Te Anau in the late afternoon. In the evening we visit the Bird centre in Te Anau. Driving further through the Otago High Country, we stop for lunch in Mandeville where we can see vintage and classic aircrafts. We reach the East Coast of New Zealand's South Island. Visit the Olveston House in Dunedin which is an eloquent expression of one man's dream. A tour of Olveston allows an intimate glimpse of the lifestyle of a privileged family in the early 1900's. It reflects a lifestyle enjoyed by just a few, but represents a most important piece in the mosaic of early New Zealand life as a whole. On the Otago Peninsula we encounter the "Capital of Wildlife", with the worlds own mainland Albatross colony. We undertake a guided walk through the facility. Visit of the Dunedin railway station in the morning. Continuing our journey towards the Mt Cook National Park we stop at the Moeraki Boulders, a curious looking mineral attraction thrown millions of years ago onto the East Coast of New Zealand and carry on through landscape covered in Tussock grass known as the MacKenzie Country. Stop at Lake Pukaki and Tekapo to enjoy mountain panoramic views (such as Mount Cook). Continuing towards Canterbury, werrive in the afternoon at the home of a farmingly who will cordially welcome you and undertake a farm tour with you. The day ends in the farm house with a dinner enjoyed together with your hosts. Today you pass through Geraldine and Ashburton, small farm townships belonging to the Canterbury Plains, New Zealand’s most intensive farming district. It is the largest flat country area in this country where you can see not only all varieties of farm animals including deer and emus, but also everything that ulture in this climate has to offer. Canterbury is the 'granary' of the country. On long, straight roads you drive through this area intersected by wind protection hedges to Christchurch, the 'most English city outside of England' and the South Island's biggest city. A city tour completes another exciting day. Today you will leave New Zealand for your next destination.